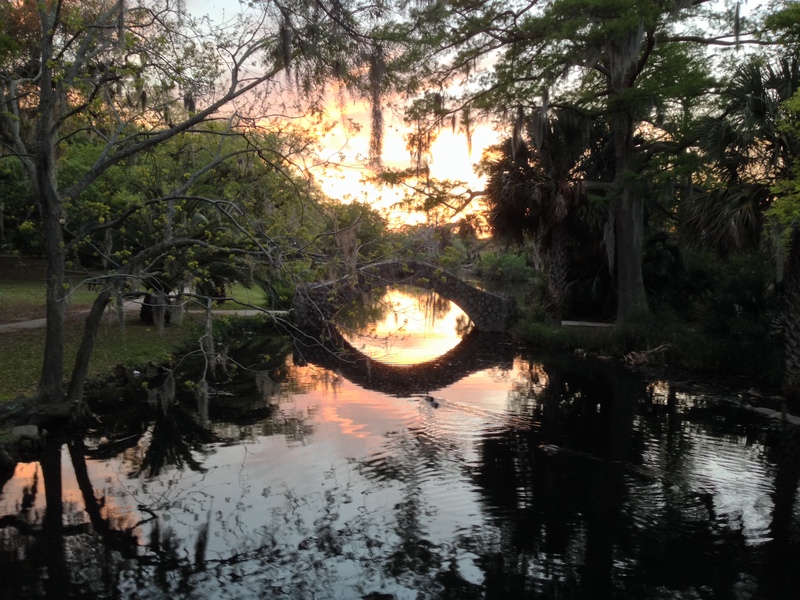 What are your plans for 2015, City Park? There is a lot going on at City Park and sometimes it’s hard to keep track of all the changes and improvements. We have repaired most hurricane damage, but we are also building a better park in concert with the Park’s Master Plan – City Park 2018. We’ve put the following list together to help you keep track of Park progress. • Opened the new dog park – City Bark! • Begin construction of a new championship level golf course and club house. What will I likely see in upcoming years? Do you see the tulips? You will see them SOON! 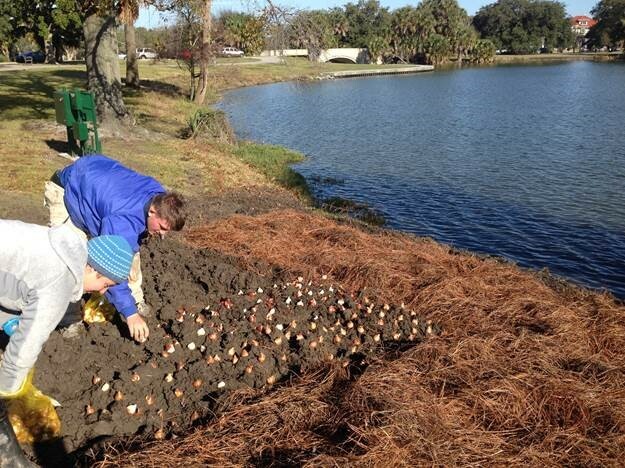 Today, City Park staff, including Charlsie, Dillon, and Dan, planted 12,000 tulips on the bank of Big Lake. Yep, you read that correctly - 12,000! We’ll all be thanking them in a couple of months when a stretch of the path (near NOLA, between the lake and Lelong) is in FULL bloom. Soon you'll be able to walk the Zemurray Trail around Big Lake and it'll be like tiptoeing through the tulips! Fair warning: after a walk, run or spin around this three-quart-mile trail ringing Big Lake, you may never go back to a drab gym. This scenic path is designed for walking, jogging or biking, and is one of the most beautiful places in New Orleans to burn off a few po-boys. As with all of our flower fields, please remember to take only photographs. Please don't pick the flowers or on trample them. There's even MORE to the Big Lake area! Not to be confused with that other “big lake” just outside of the city, City Park’s Big Lake has been one of the Park’s most popular recreational attractions. The lake is surrounded by 25 acres filled with art installations, wildlife and wetlands, paths for walking, jogging and biking, the New Orleans Museum of Art and much, much more! Parking is available on Lelong Avenue and in a lot on the north side of Big Lake on Friedrichs Avenue. City Park’s Singing Oak is one of the many unexpected delights visitors stumble upon when exploring the park. This large oak tree, which sits adjacent to Big Lake near the intersection of Wisner and Lelong in the John S. McIlhenny Meadow, is strung with a set of wind chimes that ring a pentatonic (five notes per octave) scale. This musical art installation was designed by artist Jim Hart, and is proof positive that there’s always music in the air in New Orleans! Fun fact: one of the chimes in the Singing Oak is 14-feet long. See City Park from a new perspective! Spend a lazy afternoon floating with the ducks, swans and geese on the park’s historic bayous and lagoons. Click here for details. Explore City Park on two wheels! City Park’s four miles of bike paths take riders from Bayou St. John to Lake Pontchartrain. Plus there are trails around Big Lake (3/4 of a mile) and the Festival Grounds (1 mile). No bike? No problem. Bikes can be rented from the City Park Boat House on Big Lake. Take s troll with a friend on a tandum bike. Have fun on a surrey bike with a canopy. Click here for details. Wheel Fun Rentals provides both our bikes and boats for rental. This painted aluminum sculpture by New Orleans artist Wayne Amedee is dedicated to the countless individuals who helped rebuild the city following Hurricane Katrina. The red and green aluminum structure is located along the jogging path to the right of City Park’s main entrance. The New Orleans Museum of Art celebrated its 100th anniversary in 2011 and is the city’s oldest fine arts institution. The museum sits just steps away from Big Lake and is home to a permanent collection of 40,000 objects ranging from French and American art to photography, glass and Japanese exhibits. Don't miss the the five-acre Sydney and Walda Besthoff Sculpture Garden holds more than 60 sculptures collectively valued at $25 million. It's located just to the left of the entrance to NOMA. Fun Fact: Just to the left of the sculpture garden is the famous Dueling Oak. At every turn, you’ll find something to love around Big Lake: rare and native birds, including brown pelicans and the Park’s waddling gaggles of ducks and swans; the Pump House; the lake’s fountain, which shoots water 40 feet into the air; the Louisiana Trail dotted with trees representing our state’s seven distinct tree regions. The lake is divided by the Enrique Alferez bridge, and the tranquil, smaller section of the lake – a popular spot for picnickers and the park’s geese – flows into the Besthoff Sculpture Garden. Our advice? Take your time, explore all of the nooks and crannies around Big Lake, and come back for more as often as you like! The Trust for Public Land, in partnership with City Park, developed this trail and meadow to commemorate the indomitable spirit of the residents of Greater New Orleans for their resilience and commitment to rebuilding their homes and neighborhoods after Hurricane Katrina. We believe parks and open spaces are essential elements that support vibrant, thriving communities, and we believe growing City Park is key to a healthy New Orleans. 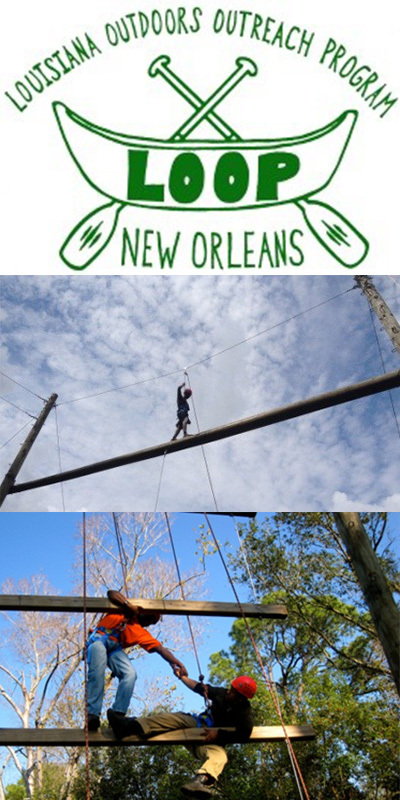 Located in New Orleans City Park, the Challenge Course has helped school groups and community organizations increase team cohesion and safely strengthen participants’ confidence. In 2015, Friends of LOOP will be expanding its climbing schedule, and we encourage your group to check out the action.